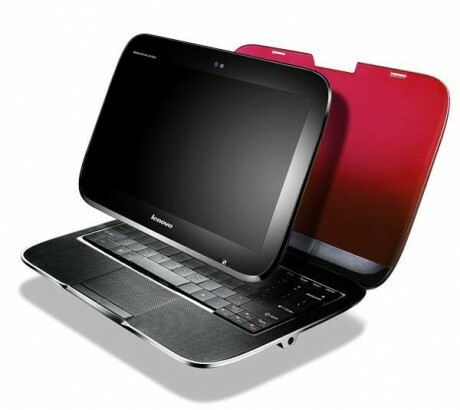 This is our first gadget seen in CES 2010, If you are thinking of buying a notebook and a tablet, Lenovo might have an answer for you lenovo IdeaPad U1 Hybrid serves as laptop and tablet as well. Lenovo IdeaPad U1 Hybrid Specification : It is a 3.8-pound IdeaPad U1 Hybrid is a 11.6-inch laptop with a retractable multitouch screen.Then the screen is locked into its upright position in the laptop’s chassis, it’s powered by a CULV Intel Core 2 Duo processor and runs Windows 7 Home Premium. Since this is a dual purpose gadget, the screen could be pulled out and when the screen is pulled from its shell it becomes a Qualcomm Snapdragon powered-multitouch slate with a 16GB SSD that boots Lenovo’s customized Skylight Linux interface. According to engadget we have to wait until June to buy the $999 device.